Adrienne of The Rich Life (on a budget) with her new COS bag bought in Paris! While we wait for it to finally feel like spring, Adrienne of The Rich Life (on a budget) and I thought it was a great time to focus this month’s “How I Wear My” on that workhorse of any wardrobe, the Everyday Bag. There is glorious variety in the pictures everyone sent but I couldn’t help grouping them according to bag similarity. I know I say it every month, but as much as I love bags, this has to be my favorite post of this series! From totes to shoulder bags, from crossbody to handheld, from vintage and inexpensive to those by bridge brands and the highest of high-end, there is a bit of everything in this post. Enjoy! Silk Path Diary with her wonderful Hermès Lindy. I love this neutral look. Catherine of Not Dressed As Lamb. I am in love with this bolt of blue shopper! 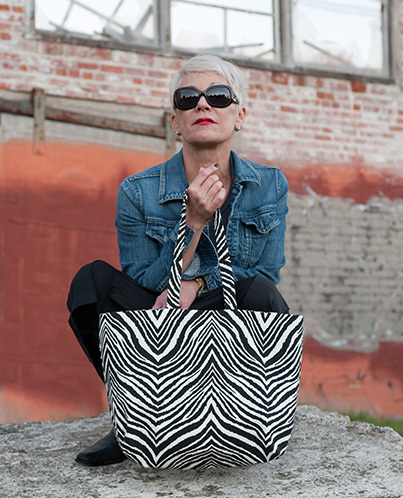 Debra with a very cool handcrafted black and white tote by Sylvia Steininger. Now I want one! Heather of Stylemindchic and her Michael Kors bag. I want to be wherever this is. It looks fun! 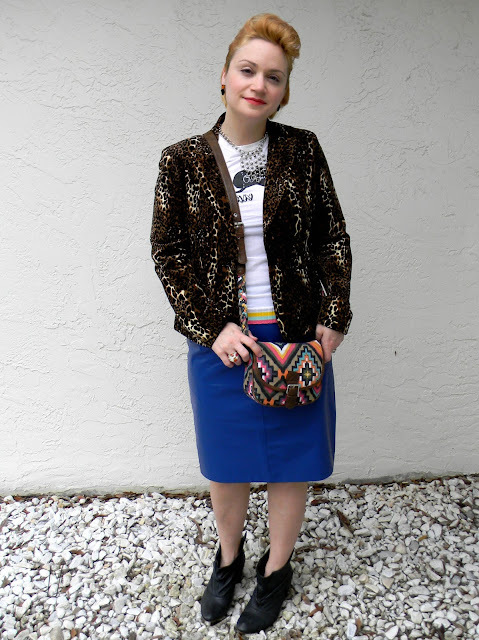 Amy of Denim & Dots with a lovely pop of color by Kate Spade. 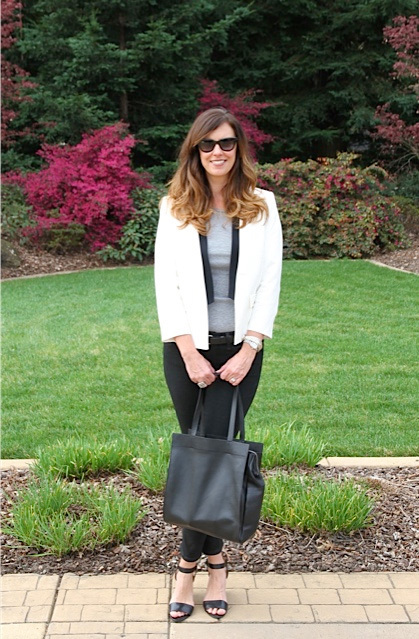 Alicia of Spashionista Report and her white Jessica Simpson bag, perfect for spring. Martha’s bag reminds me of a Valentino Rockstud tote. I love it! 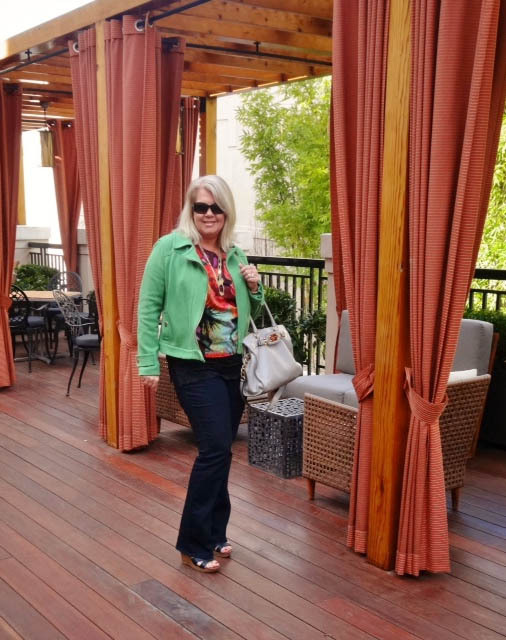 Susan of Fifty, not Frumpy carries the perfect neutral handbag by Nine West. 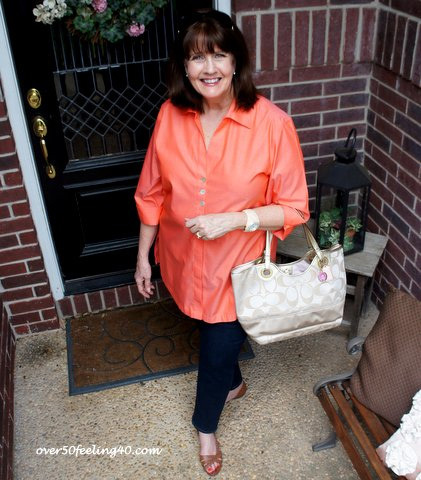 Pam of Over50Feeling40 with her Coach bag. She got it at a consignment shop! Déjà of Une femme d’un certain âge and her beautiful Chanel tote. Mama like! Jeannie of Gracefully 50 looking snow bunny glam with her Louis Vuitton. 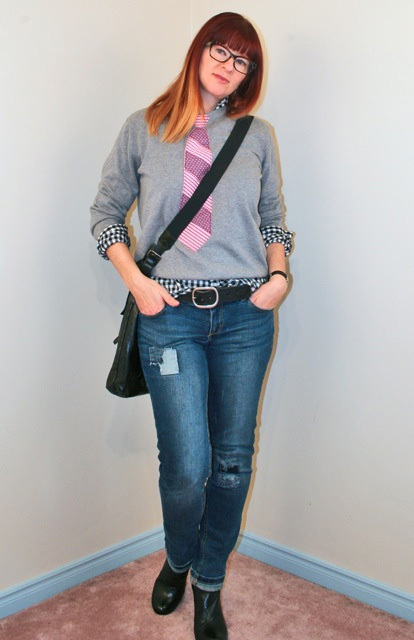 Sylvia of 40+Style. I love the side details of this bag and I am wild for those ballet flats! Veshoevius of The Taxonomy of My Wardrobe with her Michael Kors shoulder bag. 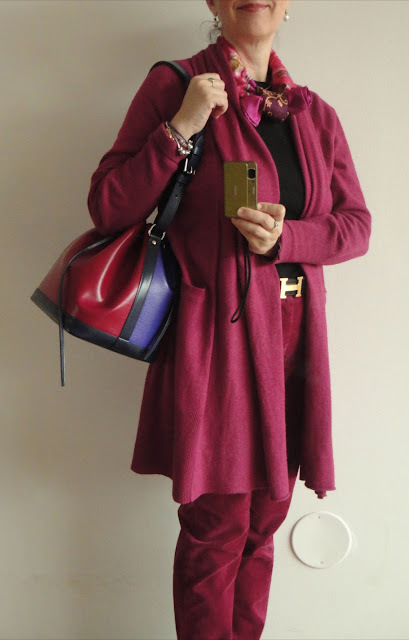 happyface313 with her colorblocked Louis Vuitton Petite Noé. I adore these colors! 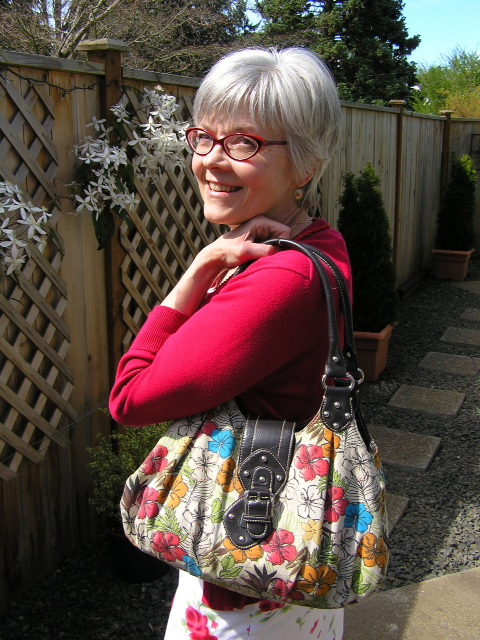 Val of Late Blooming Sparkle and her summery St. John’s Bay bag. Elle of Elle’s Collection and her Hermès Kelly. Pardon me while I weep over my dream bag! 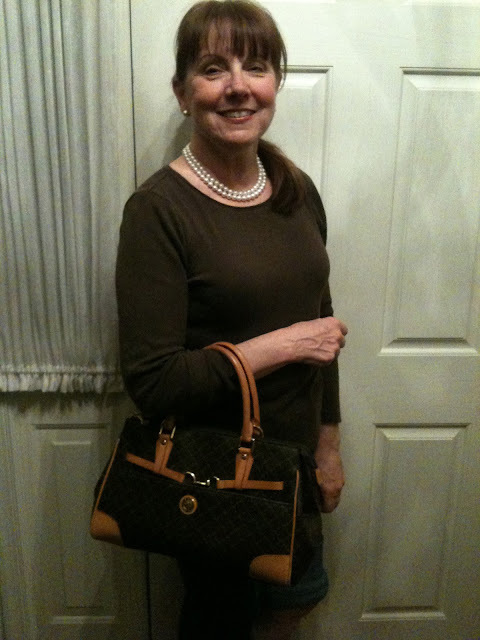 Heather of Vintage French Chic with her vintage black alligator bag. My mother (Hi Mom!) and her Rioni bag, which she jokingly calls her practice Louis Vuitton! Becky of Pink Cheetah Vintage. She got this at Payless! What? I love the colors. 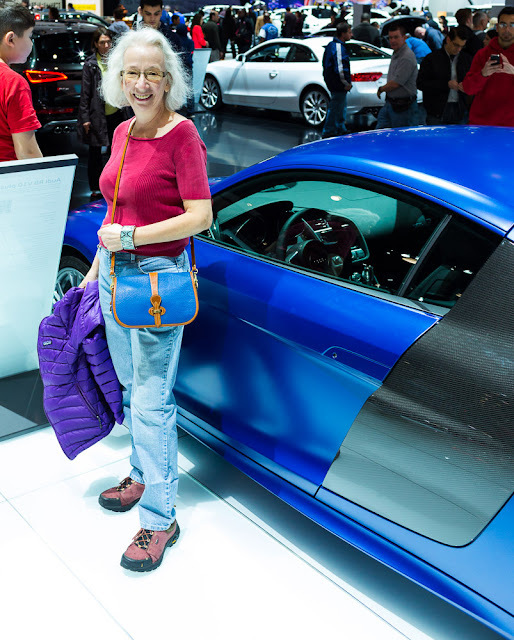 Teresa at the NY Auto Show with a lovely blue Dooney & Bourke bag. Photo by Denton Taylor. Marina of Antares: Alpha Scorpii and her thrifted brown crossbody. Don’t you love those pants? Juli of Fragmented Worlds with a colorblocked Garbo bag. It’s still winter for her too. Suzanne of Suzanne Carillo Style Files. She made that shirt herself, btw! A close-up of Suzanne’s black crossbody. Lucy of A Leopard’s Spots says her bag is perfect for chasing a toddler around! 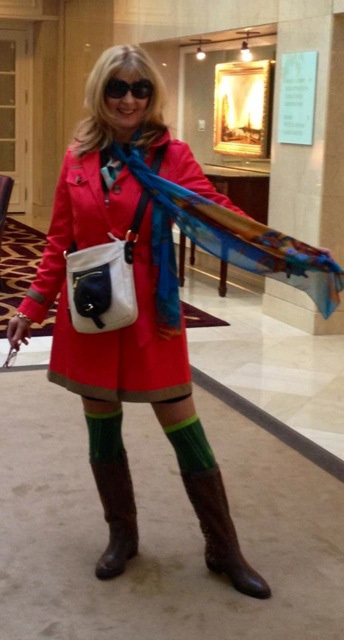 Marian took this bag with her to high tea at The Langham in Boston. Love! Déjà vu! 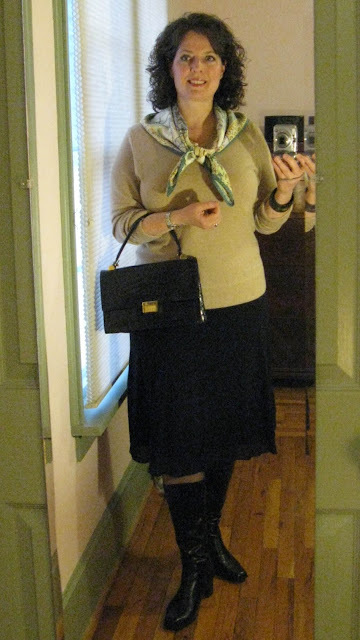 Here she is again, this time with a great black crossbody by Golden Lane. 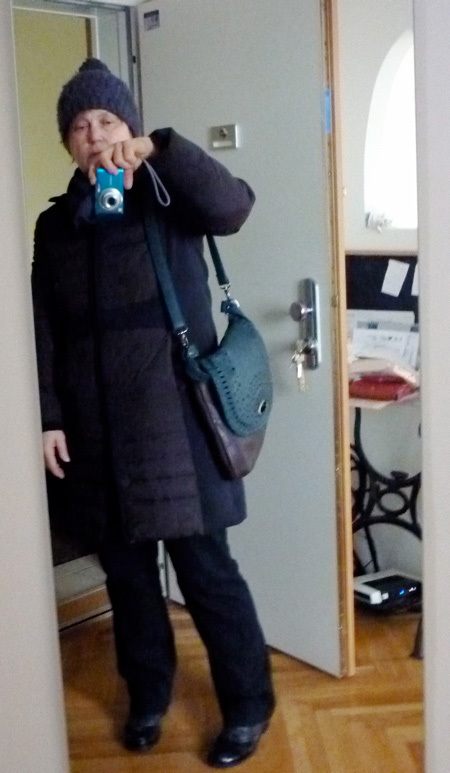 With my Marc by Marc Jacobs bag. I have about 17 bags of all kinds but what I really needed, and took awhile finding, was a new basic black bag to replace one that had fallen apart. I wanted it to be ladylike, with the option of wearing it crossbody or holding it in the hand. While I was working at Bloomingdale’s I discovered the Marc by Marc Jacobs Globetrotter Mini Rei and every time I had to re-merchandise the handbag wall on which it sat I got to know its features because I was constantly going to the stockroom to replace one that had been sold. One night while working, I suddenly realized the Globetrotter Mini Rei was the bag for me and bought it on my break! It comes in other colors like a rich caramel and a great tomato red but I had to have it in black. I will wear it everywhere this spring and beyond. This bag comes with a long adjustable strap to wear it crossbody as well. I love the big zippers on this bag. 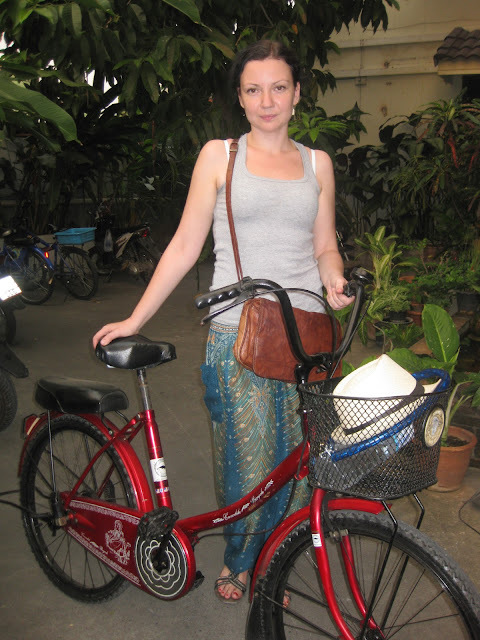 Do head over to Adrienne’s to learn more about her bag purchased at COS on a recent trip to Paris, lucky lady! For May, we’ve been thinking about adding a touch of metal to everything—nails, shoes, bags, clothes! Did anyone else notice the metallic trend on the red carpet at this year’s Oscars? 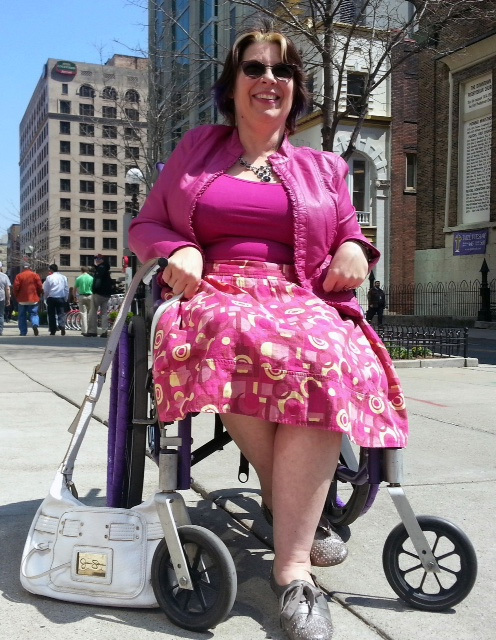 Please join us for “How I Wear My: Metallics” on May 1. Send a picture to Adrienne or me by April 30. It’s your chance to shine! And thanks to all the fine foxes who participated this month, our biggest group yet. Starting in May, instead of trading off playing hostess as Adrienne and I have been doing, we will each feature participants. It will be a great way to focus further on all you lovely ladies and your outstanding looks! This is such a fun post! Thanks for hosting. It's fantastic to be part of such a stylish, creative group of bloggers. What fun to see everyone's bags! I love your Marc by Marc Jacobs bag; it looks like such a classic yet practical design. Thanks for including me, and hosting this roundup! Loved this...everyone has such great fun bags!! Thanks for hosting and Jill and Adrienne, you are...tres chic!! That Kelly bag...I die! I'm not a big bag person but that one has me drooling. Thanks for hosting this...lots of great unique and classic styles. Awesome photos! And great bags! I'm so happy to be here among what has to be the best company on the 'net. I wish I had time to comment on every single photo but let me just say that the bags are beautiful and the ladies wearing them are gorgeous! What a lovely group of ladies and beautiful handbags! So honored to be included with such luminaries from the blog world!!! Jill, what a great post. Thanks for your time and hard work, my darling girl. So many great bags and great bloggers! I love your bag- the zips is hips! xo! Love this post!! Glad to see so many ladies with all types of bags! Your black bag is perfect for everyday, esp since it comes with adj strap for cross-body. Thx for allowing me join the fun! Wow! This looks great - a fantastic array of women and handbags. I love your bag. It's so classic and ladylike. I love black with gold accents. Speaking of gold, I am looking forward to May 1st's post on metallics! Thanks so much for this post Jill! I love seeing everyone's bags, so much fun and informative. There are styles and colours I wouldn't have considered previously for myself but will have a re-think now. Look forward to the next one - great topic! OMG purses!!!! Love it!! Want them all-- such a fun post! Thank you for hosting! Much love to both of you. Hiya Jill! I have to say I love your little Marc Jacobs bag - so chic! I do love his bags and have collected two now that I use quite a lot too. But my Michael Kors is my old faithful! Very fun post - all those handbags and purses are marvelous! Great show! Everyone looking very chic. Thanks for hosting - this was fun because I love bags, too! I really like your Marc (do you call it by name? Maybe I'll name mine Louisa). I think I'd go for the red, but black is so classic it's always a good choice! Oh I always miss the good ones! I keep missing the deadlines to post on your best posts! I love this...love the variety of bags! Your bag is divine, Jill. This is my first visit to your blog and I just have to say I love this post. I love the range of ages, the range of styles, the range of bags. Everyone is beautiful! Such fun to see my pic! Nice job! Keep up the creative work! 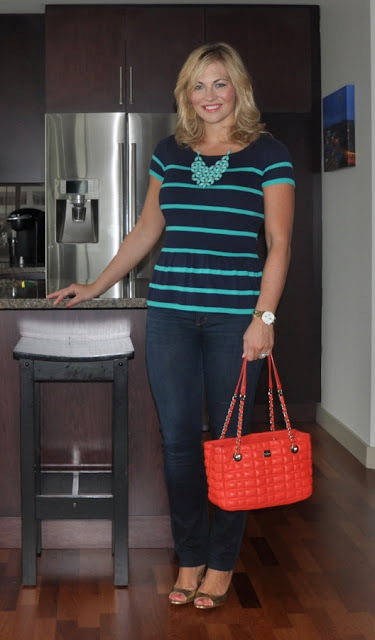 Thank you for hosting such a fun "How I Wear..." If someone says handbag--I'm there! That's a lovely post and a good glimpse on other women's bags.There are so many styles out there and all look fabulous. 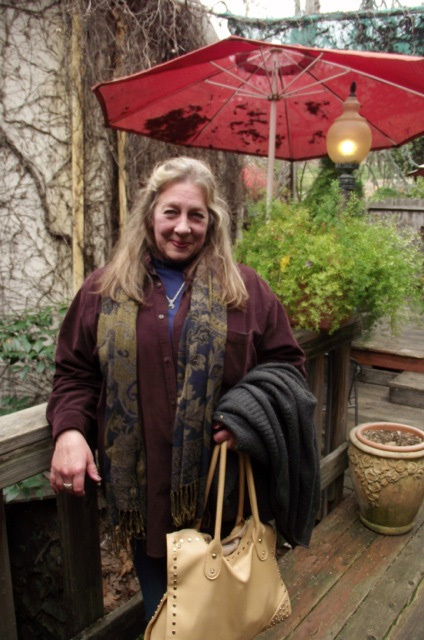 Thank you, dear Jill, for all the work you are doing to feature all of us with our bags. What an honor to be found inbetween all these interesting ladies and their lovely bags! How did your teaching go? Excited to hear your story! My computer is still down and I always have to find somebody elses to write my stuff ;-) Apple tell me every day "tomorrow!" - not funny face for that one!